Can you help identify this photo? 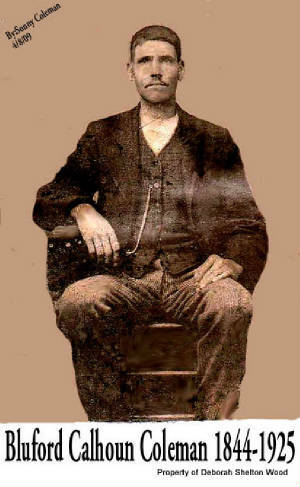 Looking for identification of the man in this photo, probably taken 1870-1885, Carroll Co VA. I believe it is my g-grandfather, Buford Calhoun Coleman aka Bluford or one of his sons. Bluford Calhoun Coleman lived 1844-1925 in Carroll Co VA and was a Civil War Veteran. His wife was Maggie Willard. In Beautiful Downtown Yosemite, Ky.